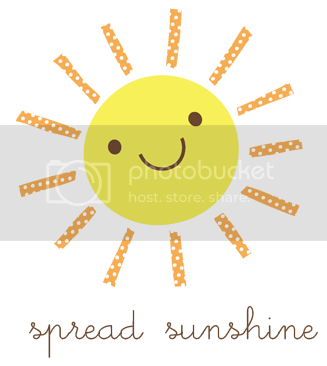 Jamie here...how are you doing this fine summers day? Hope you are having a great summer and enjoying lazy days with family and friends. 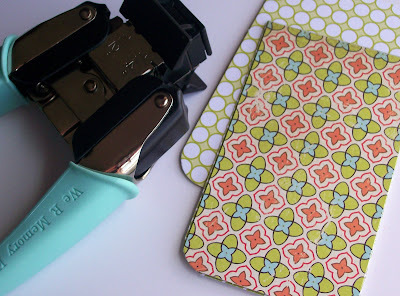 Along with all things fun and summery, I have been having a time of making jotters. 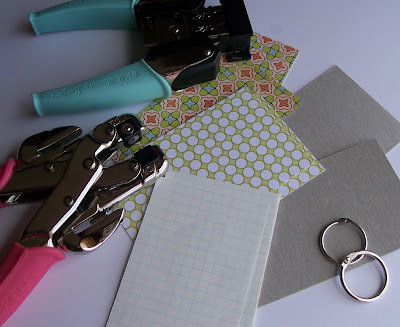 Easy, peasy jotters that are so very simple to put together, yet so very useful when they are done. Since I am one to always be making lists, I am now making just about as many jotters as I am lists. Book lists, sketches, future trips I dream about, movies and books I want to see and read. See all the excuses, I mean reasons you have to make a jotter? 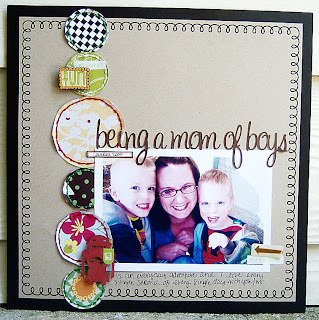 Cover inside and outside of chipboard covers with patterned paper. Round corners. 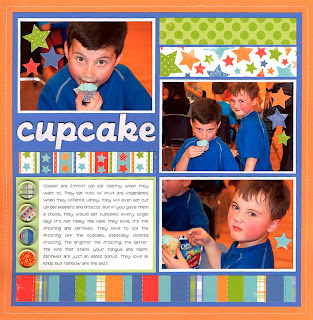 (I just bought the We R Memory Makers corner chomper...I LOVE IT!!!!). Sand edges as needed. 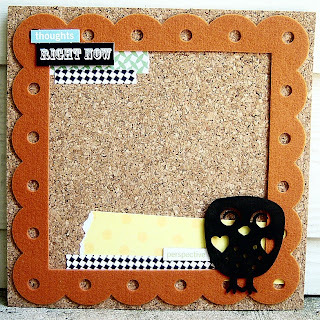 Using your crop a dile punch two holes at the top of the chipboard covers. Use those holes as a guide to make the holes in the filler paper. Add book rings. The rings used for this book are 3/4 inch. These were found on etsy. Then, embellish at will. Or not at all...it's up to you. 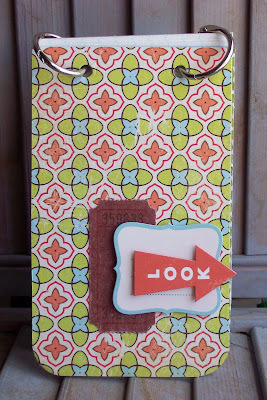 For this particular book all paper and embellies are from the August WIP kit...a most excellent kit I might add. These are just great jotters to have all around the house, in your bag, in the car. 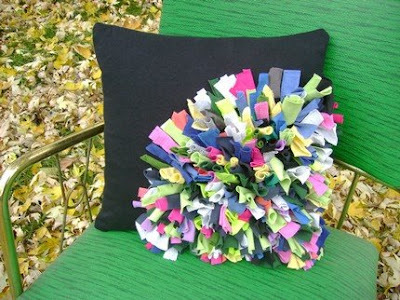 A great way to utilize your scraps too. And as a bonus, I love to have my fav papers on the covers so I can look at them all the time. 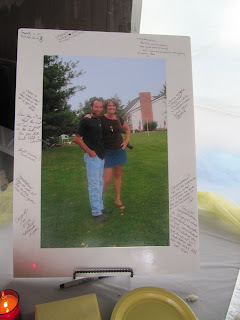 This past weekend my husband and I were surprised with a 25th anniversary party given by our family and friends. We did not suspect anything, especially since it was during a camping weekend we had planned since back in February. There were so many cute ideas, I thought I would share them here. 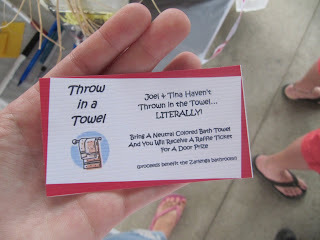 After being married 25 years they did a raffle, for everyone that brought a towel to benefit our bathrooms, they got a raffle ticket to win one of several prizes. I don’t think I will hear that we need towels for a long time in this house! It was a fun weekend we got to share with wonderful family and friends! Everyone seems to be cutting back these days. I decided to challenge myself and see how much I could make with a limited amount of supplies. I supplemented the rest from my stash. 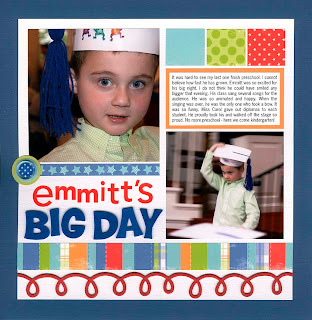 (cardstock, letters, ink, adhseive and stamps). From this I was able to create 4 layouts. After I finished the pages, I used my scraps to create 15 quick cards. That's pretty economical and now I have tons of cards for all the birthday parties my boys get invited to. Challenge yourself this month to try this with your WIP Kit. how many pages can you make? How many cards can you whip out with the scraps? With all the money that you save in greeting card purchases, you'll be able to buy some new CHA goodies when they come out! Hi Everyone! I have to tell you that I am in love with the WIP August kit. My husband and I travel a lot, and we love visiting new places and revisiting old places, so this kit is perfect for us. One of the things that I've done with this kit is to create a mini album to showcase all of the places that we've visited, and will visit in the future. 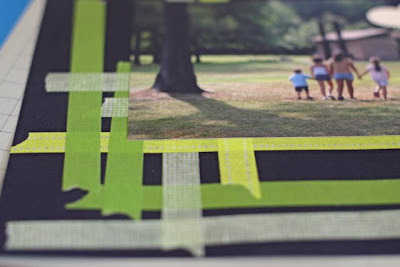 The neat thing about this kind of album is that you can keep adding to it, and these papers are so versatile, you easily add new ones from past WIP kits or future WIP kits to the album when your August kit runs out. First I cut my papers to 4x6, mostly because that's the size that I print all of my photos. I'm not too worried about landscape or vertical photos, because that is just too much to worry about right now. The point is to showcase the photos and the memories. Then, you want to decorate your cover. I just did something simple. Again, focus on those memories, the cover is just that...a cover. 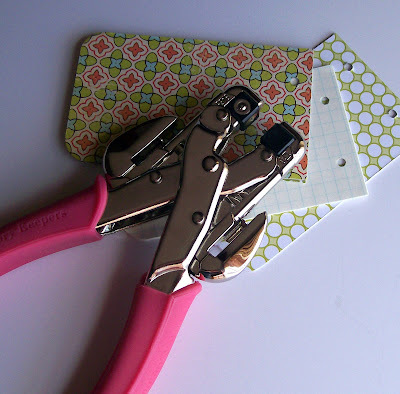 Punch holes through your papers with your crop-a-dile or a hole punch and get yourself a jump ring, or some chain, or a piece of ribbon to hold the album together. Now you are ready for photos! I decided to focus on a favorite photo from each trip. Some of them are a fave of the trip, and some of them are just duplicates that I somehow printed twice. I tend to do that a lot, and this is a nice place to put those extra photos. 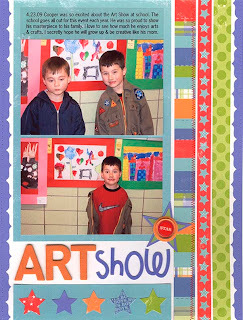 A few things you can do with your photos are adhere them directly to the paper with a journaling card or simple label of place and time of visit. Or, you can do another little trick I learned. Adhere your photos together. I do this a lot, and it is a great way to add space to your minis. So, one page is just two photos, back to back, and then you have room to add a journaling card or whatever to the corresponding page. A fast and easy mini album that you can add to whenever you feel like it. I don't really measure it out, I just rip a piece off and go with the flow. When doing a grid type of formation like this one, I just play until I get it right. The bond on the tape is a bit forgiving, so if you need to pull it up and readjust, it compensates. I used 3 different types of the same colored tape in this one. 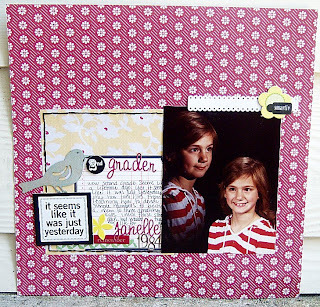 I simply chose a photo and embellishments, and put them on top of the design. 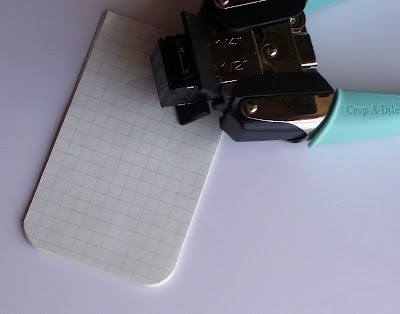 If you wanted to use them as journaling strips, be sure to use a slick writer of some sort, as the coating on the tape won't absorb the ink otherwise. Nothing to it! 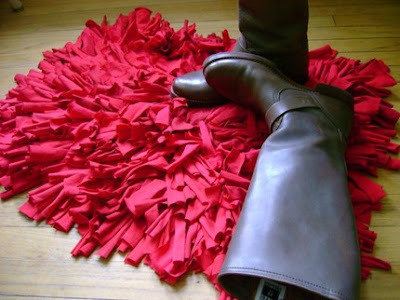 The same thing could easily be accomplished with strips of patterned paper, too. Kind of fun!! Hope you all enjoy a wonderful weekend!! Talkinsquid has these beautiful pillows and rugs over on her etsy site. Love the colors! 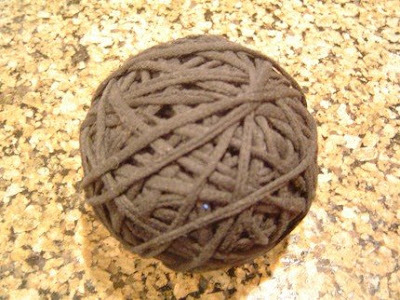 Did you know you could crochet with it? Sure can! These adorable dresses are actually repurposed old t-shirts by Prairiemama. She also has adorable sundresses made from pillowcases over at her etsy site. Thought the idea was amazing! ...This one is from the August WIP kits... 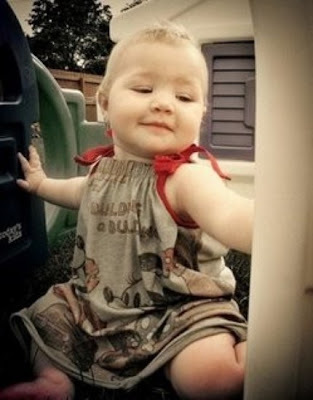 This photo of my niece was printed at Scrapbookpictures.com. It appears they're having one heck of a sale, so be sure to check them out! 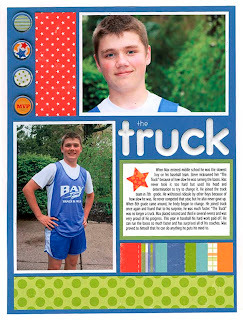 The candy box project was posted last year and can be found here. Several local gals who frequent our home have seen this in person. 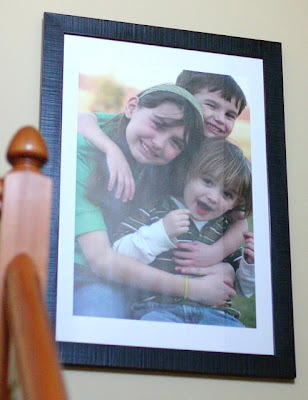 Hard to get a scope of the size, but this is a canvas photo of our kids on the landing. It is big--20x30 is the size of the canvas. I got it at artscow.com, and I can't sing their praises enough. From now until August 31, they're running a special on these huge canvas'...TWO 20x30 canvas photos for $24.99...with FREE SHIPPING. (coupon code 2030CANVAS). Now, when I ordered this baby, I was tickled because I got ONE at that price. Couple of things...the canvas ships rolled up. I was hoping for the stretch canvas--this is not the same thing. I went and got the frame at Michael's and used a coupon, so it is under glass. I didn't purchase a mat for it, I simply kept the packaging label inside the frame, turned it over and mounted the canvas on top of it. I love it--and when I get sick of it, I won't think twice about changing it up. The entire project cost me less than $50. And this one is of our youngest little stinker. The pictures were taken by his older brother, and I'm happy with how they turned out! When I first saw this month’s kit I was giddy with excitement with layout and mini book ideas for all the recent vacation pictures I have taken. But then I thought about life in general and all the detours that my family and I have been through, the travels through life itself that take us in different directions. Like that job change that you didn’t plan on, or how a relationship grows and changes throughout your life. So many directions and quotes that have to do with life in general, I found new directions no pun intended to go with the kit. 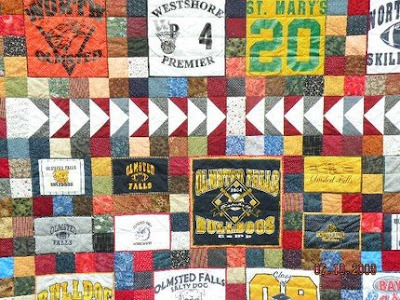 Here's a layout I did for my teenage son whose coming into those years of his life where there are many changes, many detours. I'm tickled to announce that Work in Progress Kits is doing another Design Team Call!! Work in Progress Design Team Call!! 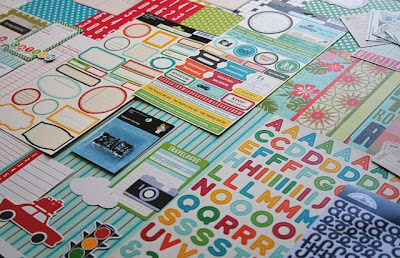 Work in Progress Kits is a monthly scrapbooking kit club and we are looking for at least 2 new designers for our team. We are looking for designers that can create pages using not only traditionally not-matching kits, but also projects and altered items as well. 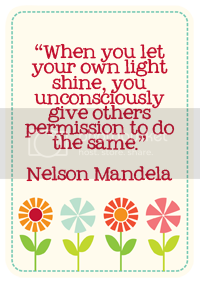 Are you that person who can think outside the box? We will be taking submissions from now until Tuesday, July 28th, 2009 with the winners to be announced Monday, August 3rd, 2009. Provide quality scans/photographs of 4-5 projects a month using (but not limited to) our kit. The work has to include a title, journaling, and not just single photo layouts—I’m looking for a variety of work that showcases your style. 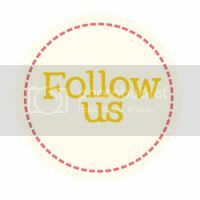 Provide tips along with detail shots of projects for our website & blog. I feel strongly that the WIP blog represents not only the kits, but me personally. That being said, I expect the design team member to post twice monthly on scrapbooking techniques, projects or layouts (in addition to the ones they submit monthly). 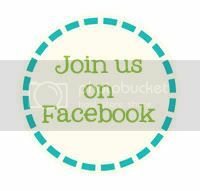 Help promote Work in Progress Kits on other message boards and facebook. 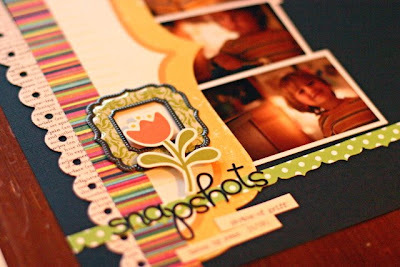 Provide a link to WIP kits and the WIP blog on your blog and/or facebook account. All projects made with the DT kit are yours to keep, and when used in the newsletter or on the website, you will be given full credit. As our designer, you can also submit your own work for publication after 1 month of debut of the kit, as long as you give Work in Progress Kits proper credit. Your compensation will be a free monthly kit along with no shipping charge! 3 recent layouts (12 x 12, 8 1/2 x 11, doesn’t matter). I have to be really honest here—I am looking for not only detailed work, but work that is also heartfelt. Titles and journaling should exist. Really tell me who you are through your work. Please submit pages that don’t all contain one photograph—I’d like to see a variety in your presentation. Please only submit your original work! 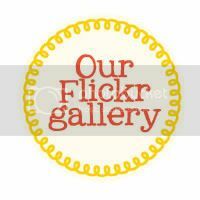 Link to your online gallery, blog (a blog is a requirement to be on our team) and scrapbook resume. Please also list what current design teams you are on, along with any other commitments you may have. 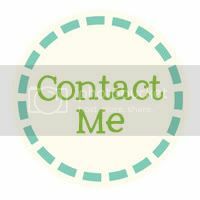 Your full contact information: name, address, phone number, email address. A short paragraph or two of why you want to be one of our designers. Describe your style, who and what inspires you, and your passions outside of your family and this hobby. Being a current customer is always a bonus, but not a requirement to apply. If there are any other reasons I should consider you as a DT member, please list them! If you do sketches, have a certain talent for cards, belong to 12 message boards, design original stamps, sing your own praises!! 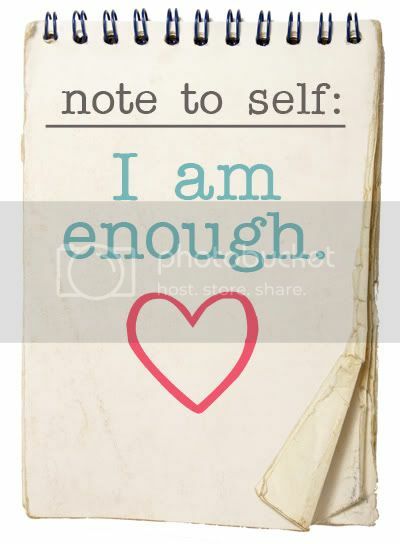 I won’t know unless you tell me, so stick your neck out and brag about your strengths and hidden talents. Being published doesn’t really hold any weight with my decision. This isn’t to offend anyone who has been or will be pubbed—it is simply to encourage those of you out there who think they’re not good enough to indeed apply. I go with my gut, and I know what I’m looking for, so don’t be discouraged. Let the submissions begin!! Good luck to you all!! 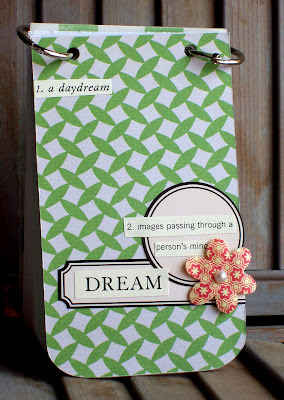 I saw this over at 2Peas in the Designing Garden as part of the Make Mine Mini series, and I LOVE the concept. 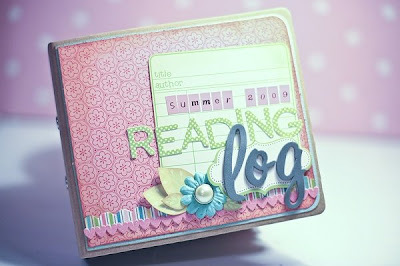 This particular one is done by the amazingly talented Shimelle Laine, and the directions and pdf for creating your own summer reading log can be found here. Looks like my Friday evening crop time project, don't you think? She had me at, "Free Library Card Printable." I'm a sucker for those! 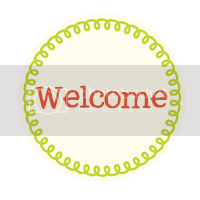 I'd also like to direct your attention to my dear friend, Jen Forbus' book blog. She is a local gal that I've known forever, and she started her book blog over a year ago. 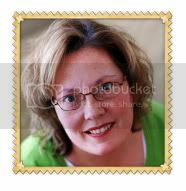 She has traveled all over and interviewed a lot of authors, so be sure to check out her blog and say hello. Have a great Thursday, all!! I just wanted another excuse to give another August WIP kit away. :) Join us, and I'll do a random drawing from the group of WIP Facebook Fans on Thursday, and you could be the lucky winner!! Check it all out here. Maybe one of my most favorite kits ever. Two alphas. Loads of embellies. See those Wild Cards in the top right corner of the picture? To Die For. October Afternoon, Scenic Route and Making Memories--what more could a girl ask for? 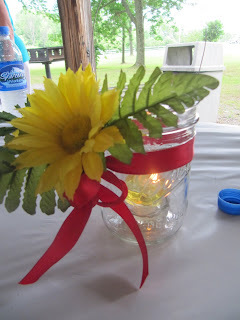 The winner of a JULY WIP kit--Charla Lang and Emily P. and Julie K. in Ohio!!! 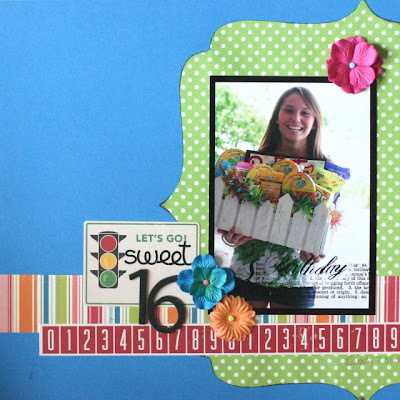 The winner of the NEW AUGUST Main kit--Amanda Engweiler!!! I'm sending out email notifications for the August WIP kits today, so be sure to check your inbox. They will go on sale to the public on Wednesday, July 15, 2009 at noon EST. I'm over the moon about the kit this month--October Afternoon has the most amazing product!! Getting in to eat there is no easy task. Good thing I have a cute hubs (long story--but the hostess thought he was sweet and took pity on the man, and we got in!!) Chris and I had the Southern Buffet--complete with fried chicken and fried catfish, the best mac and cheese on earth, sweet potatoes that melted in your mouth and salad. Get a load of that sweet tea, complete with a sprig of mint. Ahhh... He picked peach cobbler for dessert, and my daughter and I elected to go with the gooey butter cake. Now, I had no idea what was in it when I made my selection, but I know that anything with that title had to be good. It was the best dessert I've ever tasted. I mean it. Thank goodness her website is equipped with all the yummy recipes. I've been trying to re-create them for a week now, with only moderate success. The gals who scrapped here on Friday night enjoyed the gooey butter cake as much as me! Completely sinful, that stuff. But anything that packs two sticks of butter along with cream cheese has to be good, no?? 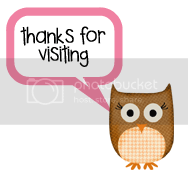 hi to all our friends out there! just wanted to share what i did with the july kit.